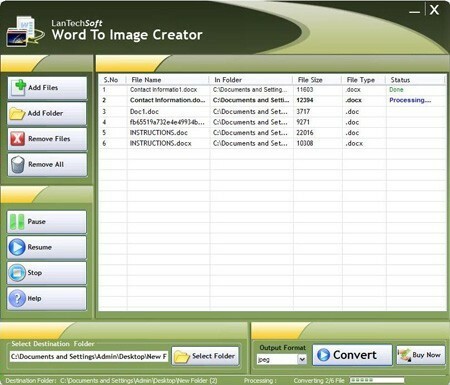 Word to Image Convertor is a powerful software for convert Word document (.doc, .docx) files into Images formats as .JPG, .JPEG, .TIFF, .GIF, .BMP, .EXIF, .PNG etc. It creates images of all pages of doc, docx files. It is a Doc to Image Convertor and Docx to Image Convertor. Images created from Word to Image Creator are very high quality. It can work thousand of word files in batch process. * It process thousand of DOC, DOCX files into Images. * It works in batch process. * Creates BEST Quality Images. Modifier PDF - Modifier PDF is a Windows PDF editing software that lets users modify and edit PDF documents like adding text and images, removing unwanted content, drawing lines and rotating PDF pages. Win PDF Editor - Win PDF Editor is a Windows PDF editing software that lets users modify and edit PDF documents like adding text and images, removing unwanted content, drawing lines and rotating PDF pages. PDF in Excel Umwandeln - PDF in Excel Umwandeln is a windows application that fast converts PDF documents to MS Excel XLS format, and let users edit the content easily. The program also supports batch mode which convert hundreds of PDF files at a time. PDF Eraser - PDF Eraser is a free Windows application that deletes and erases text, images, logos and all unnecessary objects from PDF files. Users can use the program to remove some original content from a PDF file, and then add their text and images. A VIP Sales Management Solution - Professional tool for Sales Team project, workflow management. Combines functions of CRM, TeamOrganizer, ProjectManager, DocumentManager. Allows your team to plan, track and report of your sales team's activities, share your contacts, calendar etc. PDF Editor Mac - PDF Editor Mac is a OS X free application that allows users to add text, insert images, put watermarks to label their copyright, changing font size and color, and perform other editings of a PDF document. PDFZilla - PDFZilla is a desktop application that quickly and accurately convert PDF files into editable MS Word Documents, Excel Forms, Rich Text Documents, Plain Text Files, Images, HTML Files, and Shockwave Flash SWF Files. ThesesAssistDrawer - ThesesAssistDrawer is a small, yet reliable tool to assist the editing of theses, reports, or books. This program is compatible with 2007 or newer version of Microsoft Word.